The Kyocera steak knives are delivered as a nice set in a box of two pieces. The Kyocera steak knives have especially sharp blades, which makes cutting into a real pleasure. The high-tech ceramic which is used for Kyocera steak knives, is extremely hard and ensures a long cutting durability. In addition, the material is absolutely corrosion-free. The Kyocera steak knives with it's white plastic handles are very ergonomic Set of 2 steak knives Ideal for slicing your favorite cuts of meat and poultry 4.5" micro-serrated advanced ceramic zirconia blades offer long-lasting sharpness and precision cutting utility Lightweight, ergonomic handles are easy to grip for comfort and balanced control Partial tang Rust-proof Japanese proprietary design won’t brown foods, transfer a metallic taste, and does not absorb any food elements Easy to clean: just quickly rinse and wipe. Ideal knife or table knife for everyday use. 11 cm stainless steel serrated blade. - total length of 21.5 cm. - weight of 26 g.
Sknife Tafelmesser - Swiss stable knife The swiss table knife produced in the sknife manufactory fits thanks to its optimized design comfortably in the hand. The swiss table knife convinces with its surgical steel blade and its handle made of local walnut . Therefore the swiss table knife has a four times higher corrosion resistance and high hardness of 58 HRC. The high-end table knife from sknife is a real design piece. The shapely blade is contactless on the table. The handle of the table knife – made of stabilized swiss walnut wood – is water-repellent. Extrema Ratio is delighted to apply the strict military standards to a set of professional kitchen knives. The steel of the blade is the proven BOHLER N690, a steel enriched with chromium, vanadium, molybdenum and cobalt, hardened to the hardness of 58HRC. The handle is made of Forprene, an elastomer that is in the "NATO standard" for resistance to extreme conditions, and is completely removable from the blade; this makes possible a thorough cleaning and maintenance of the knife. Talon is a new kitchen table knife that Extrema Ratio has designed for everyday use, the handle engineering plastics military specification contains a blade made of pure Extrema Ratio durable style, ergonomic and extremely effective. ZWILLING Pure is innovative but also practical; a knife for everyday work that meets the demands of the highest level. "A very simple design, but to the future, light and elegant forms and materials." So the Milanese architect and designer Matteo Thun defines the new knife series that developed for ZWILLING J.A.HENCKELS. Quality, strength, class and style are the hallmarks of knives ZWILLING Pure. 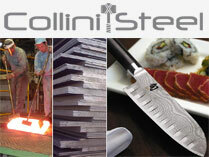 They are the new knives entered the world of forged ZWILLING J.A. HENCKELS, appreciated for their elegant design and timeless. The blade, the node and the handle, forged with precision starting from a single piece, without welds or joints, determine aesthetics without compromise, but also a superiority compared to all glialtri as to elasticity. The curved lines of SIGMAFORGE blade and the handle anti-slip ergonomic transform the operation of cutting into a real pleasure. The century-old experience of ZWILLING J.A. HENCKELS combined with the creativity of Matteo Thun, he has created a modern knife with an affordable price; a perfect knife for everyday work requirements in the kitchen. Sector 1 is a new table knife that Extrema Ratio has designed for everyday use, the handle engineering plastics military specification contains a blade made of pure Extrema Ratio durable style, ergonomic and extremely effective. Available individually in a cardboard box or in a cardboard special case of six pieces. Sector 2 is a new table knife that Extrema Ratio has designed for everyday use, the handle engineering plastics military specification contains a blade made of pure Extrema Ratio durable style, ergonomic and extremely effective. Available individually in a cardboard box or in a cardboard special case of six pieces. Kitchen Talon is a new table knife that Extrema Ratio has designed for everyday use, the handle engineering plastics military specification contains a blade made of pure Extrema Ratio durable style, ergonomic and extremely effective. Available in a cardboard special case of six pieces. Steak and pizza knife, ideal for everyday use. 12 cm serrated blade stainless steel. - Thermoplastic handle - Total length of 23 cm. - Weight of 36 g.
Steak and pizza knife, ideal for everyday use. 12 cm serrated blade made of stainless steel. - Thermoplastic handle - total length 23 cm. - Weight 36 g.
Steak knife or table ideal for everyday use. Serrated blade of 11 cm stainless steel. total length of 21.5 cm. Set of 4 table knives Opinel line Esprit Pop: colorful, practical and perfect sharpness. Made in stainless steel Sandvik 12C27, are very resistant to corrosion and require no special maintenance. The wooden handle is painted and treated, to ensure a greater resistance to washing. Not suitable for washing in a dishwasher. The unique glass bead blasting process gives the Compendio Berti knives a satin or matte finish and a contemporary look. Made from a stamping process, Compendio blades have a lighter feel while offering superb performance. The edge is then handcrafted into a convex grind. That is, the blade has a rounded profile and tapers into a sharp edge. This grind type keeps much of the metal behind the edge, making the edge stronger and keeping the sharpness longer. No paint, lacquer, Teflon, or any chemical addition is used in the production. The unique glass bead blasting is an exploration into the different finishing of the steel surface resulting in a beautiful effect, while maintaining the top performance that discerning customers expect from Berti knives. Features: Handle: Ice Lucite Total Length: 9.3" Blade Length: 4.7"
Alexander - Set of 24 artisan cutlery set Five steps to make a quality product. To make the Alexander cutlery from steel rods, you need five careful, long and expensive processing steps: - Forged by incandescent stainless steel bars - hot coining - cutting of the profile and the interiors - roughing and bending - tempera. The aforementioned phases are joined by the normal finishing operations (mirroring, machining of the teeth of the forks, processing of the handle). The forks of the forks, unlike those of the printed cutlery, are thin, turned by hand, close and sharp. the blades of the knives are sharp as they are sharpened by hand. The spoon is sober and slender, respecting the functionality. Handmade forged stainless steel cutlery, with handle in brown acetal resin. Cutlery set includes the walnut chest of drawers with cutlery compartments. The Berti Convivio Nuovo steak knife has a slightly upturned blade that ends with a rounded tip. The subtle taper of the handle curves in the opposite direction, creating a single, elegant wave from tip to handle end. It is designed without a bolster, creating a contemporary streamlined look, with the blade heel nearly starting at the handle. Berti Convivio Nuovo steak knives come in full or anchor tang. Blade is stamped with hand-ground edge. Features: Pieces in box: 6 Total Length: 9.1" Blade Length: 4.1"
- Precision forged from a single piece of steel with bolster and the internal handle built in one piece. - Ergonomic design of the handle, developed in collaboration with professional chefs. - Function and design in pure perfection. The all-steel knife for gourmets. Le Lame: I am obtained using the best steel and combining the most qualified elements (chromium 15% - 0.5% carbon - molybdenum - vanadium). The realization of a forged knife Wusthof provides for the passage of about 40 working cycles. Proper care will increase the life of the knife, makes it easier and safer working habits and reduce line wear. The Wusthof knives sold by us, are personally controlled and further sharpened in order to guarantee you the certainty of a good buy.